Photo courtesy of David W. E. Hone, et al. The movie Jurassic Park is generally regarded as a landmark film in the way it depicted dinosaurs with its computer-generated special effects. But they got a couple of things wrong in how they portrayed Velociraptor, the film’s main protagonist. Fossil evidence tells us they were not nearly as large as what was represented in the movie and that they should have had feathers—a discovery that wasn’t made until after the move had already been released. A cousin to Velociraptor was discovered in 2002 in northeastern China. Named Microraptor for its small size (it weighs in at only about one kilogram), this fossil—both strange and beautifully preserved—has added fuel to the debate over the origins of flight. You see, this 130 million-year-old creature had four wings. 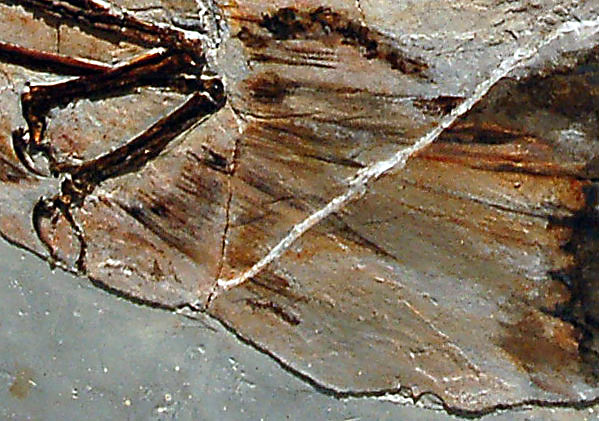 Close up of the feathered hind legs of Microraptor. 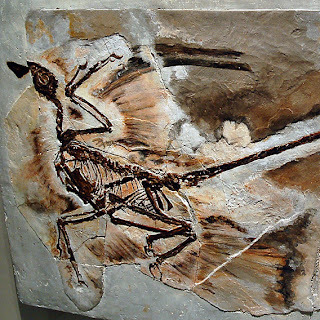 It is believed that birds evolved from dinosaurs about 100 million years ago, but exactly how has been a mystery. Microraptor, with its bird-like wings, dino tail and long, aerodynamic feathers attached to its feet, could be a missing link. Some paleontologists believe that Microraptor was a glider similar to a flying squirrel, leaping high off trees and gliding with its long back feathers over its tail to produce additional lift, then bringing its hind legs forward to create a second set of wings, similar to an old-fashioned biplane, as it slowed and pulled up to land on another tree. This challenges the previously-accepted notion that flight developed from fast-running dinosaurs with feathered arms that evolved into wings and eventually propelled them in flight. And while the jury is still out on whether this dinosaur is a missing link to birds or just an evolutionary sideshow, it is clear that as more feathered dinosaurs are discovered, we will eventually find out whether or not birds, like airplanes, evolved from four wings to two. Thanks for discussing about a new quiz related topic. This is really a informative and helpful post for every students those who participate in quiz competitions. Keep updating your site with latest information.